It's really easy to build an action plan in Azendoo. It's also very simple to duplicate a template project/process. But it when you have to reschedule a whole project, it can be quite cumbersome to change dates a single task at a time. 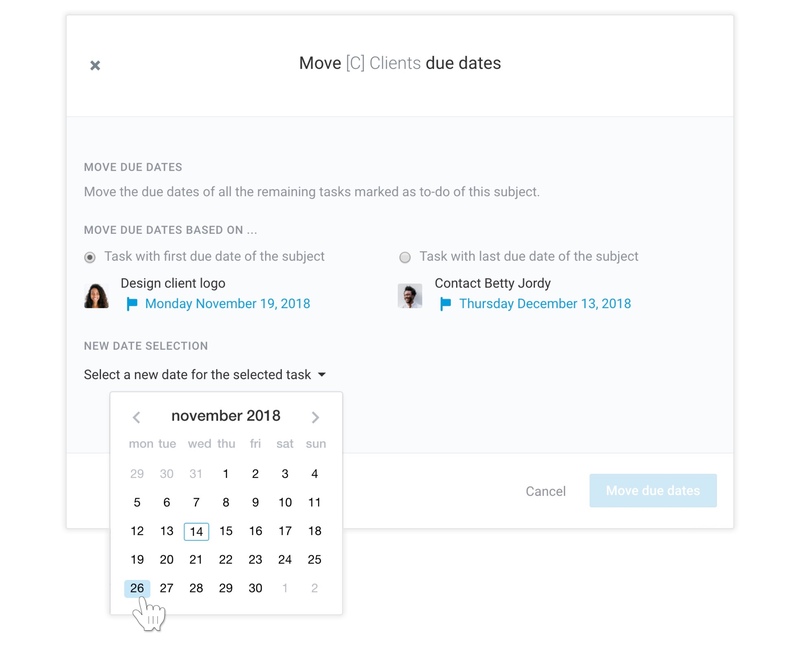 Since we're on a mission to save you time and help organize your work efficiently, we have been working on a new feature to allow you to move all of a subject's due dates in just a few clicks. The process is straightforward. 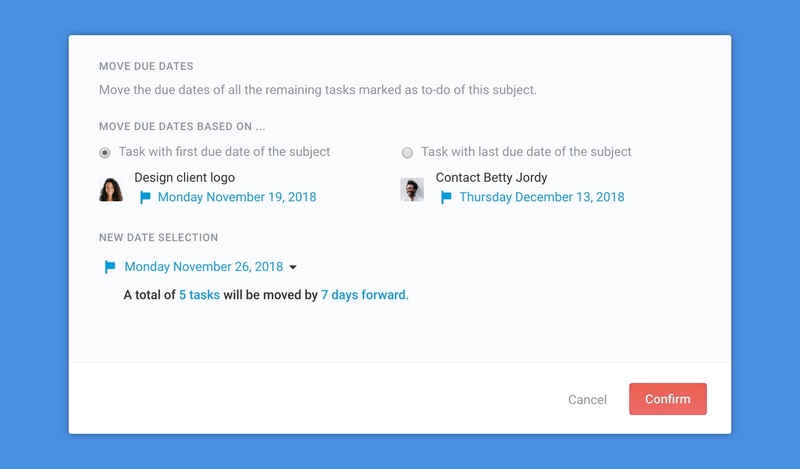 Open a subject, pick a task and select a new date for it. The difference between the current date and the newly selected date will be applied to all of the other due dates in the subject. We already wrote about how you can create template subjects and reuse them thanks to the subject copy functionality. Now with the added ability to quickly move all dates on a subject, you can make your template subjects even more useful. Add due dates to your template subject tasks that correspond to the project's timeline. 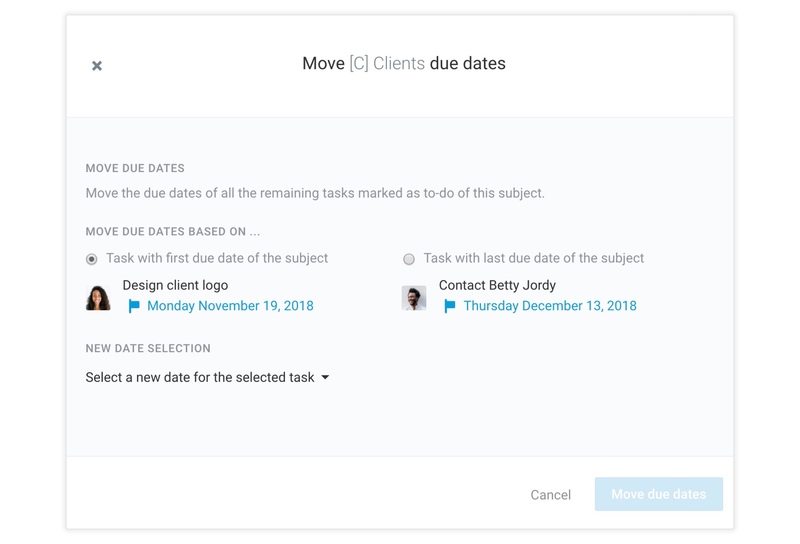 Make sure you select to option to copy the due dates when copying the subject and once the copy is complete, use this new feature to adapt the dates to your current project's needs. This will make you save time and a fait amount of clicks. In order to move subject's dates you first need to open the subject in question. Then click on the subject menu and choose the Move all dates option to display the dedicated window. From there you will have the possibility to choose between the first or last dates of your subject to serve as reference for the next steps. To make it easier, we added the task each date corresponds to, along with useful information such as the day of the week. You will also have to pick a new date for the task you've previously selected. Bear in mind that moving your due dates might mean that the new due dates end up on a weekend. To avoid this you can select the same day of the week as the current one, but at a different date. Once you have selected the reference and new dates, a summary will let you know how many tasks you are moving and by how many days forward or backward. You can always adjust your settings before continuing. You will need to click twice on the confirmation button to start the operation. The next page on the window will confirm that all dates have been moved successfully once the operation is complete. 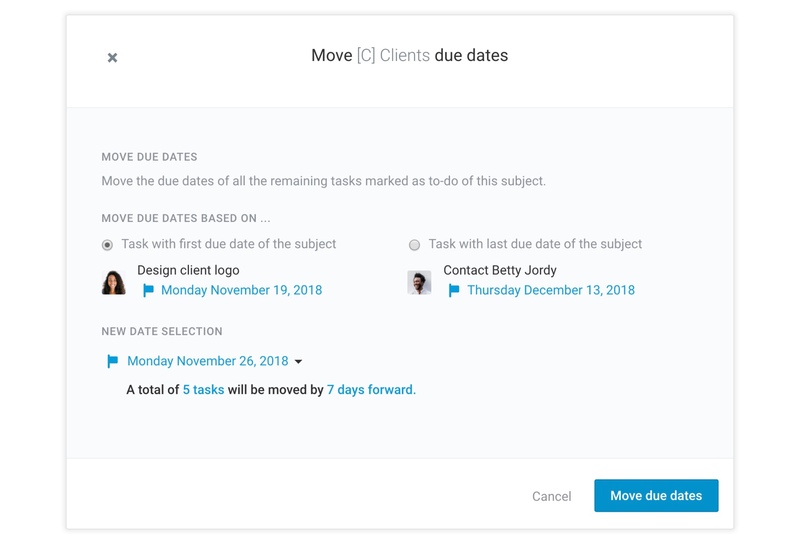 All of the tasks which due dates have been moved will have a trace of the operation in the task logs with the name of the person who initiated the move. This new feature is reserved for users on the business and Enterprise plans. As a reminder, users on the business plan also have access to time tracking and have other advantages such as unlimited guests and workspaces. Please refer to our pricing page for the complete breakdown. To upgrade to the business plan please contact us.